The podcast for law enforcement professionals and those who support them. Episode 040 of Beyond the Call A conversation with Clarke Paris, retired Sergeant of the Las Vegas Metropolitan Police Department and founder of The Pain Behind the Badge, on PTSD and suicide prevention for first responders. Clarke produced a documentary by the same name as well as authored the book My Life for Your Life. Paris also recently wrote a children’s book – Daddy, I Worry About You, for children of police officers and also offers a relevant story about his son during the show. Learn more about The Pain Behind the Badge at www.thepainbehindthebadge.com. Episode 039 of Beyond the Call Entrepreneur and 30-year law-enforcement professional, Joe Badali, discusses his company Guardian Gear. Joe’s business provides lifesaving products and services that meet the unique needs of police officers, students, teachers, and many others in times of crisis. Learn more about Guardian Gear at www.guardiangearusa.com. Episode 038 of Beyond the Call Active police officer and entrepreneur, Ryan Allen, talks about the journey of starting the company Zero 9 Holsters. He shares his story of how necessity was the mother of invention for making his first holster. Today Zero 9 Holsters provides multiple quality products to first responders throughout the world. Learn more about Zero 9 Holsters at www.zero9holsters.com. Episode 037 of Beyond the Call A conversation with Vince LeVien on being the son of a decorated NYPD Detective. We also delve into his work as the Project Manager of The Finest Service Organization offering Killed in the Line of Duty Insurance to Police Credit Unions as well as being appointed on the Board of Trustees of the Silver Shield Foundation. Learn more about the Silver Shield Foundation, which provides education funds and other services to the children of police officers and firefighters killed in the line of duty, at www.silvershieldfoundation.org. Learn more about the Killed in the Line of Duty Insurance from the National Police Credit Union at www.nationalpolicecu.com. Episode 036 of Beyond the Call The Beyond the Call crew visit Home Watch, the Law Enforcement Spousal Conference by How to Love Our Cops held in Sacramento, CA on March 2, 2019. In Part 2 of our first “On the Scene” special, listen to portions of the event including The Incredible Power of a Law Enforcement Spouse led by Vicki Newman – founder of How 2 Love Your Cop, The Spiritual Side of the Police Life led by Heather Blass, and the Parenting Panel. Also hear interviews with attendees such as Jennifer Brown from the Dallas Police Association. Hear more from Vicki Newman in Episode 016 and Heather Blass in Episode 032 of Beyond the Call. Learn more about How 2 Love Our Cops at www.how2loveyourcop.com. Episode 035 of Beyond the Call The Beyond the Call crew visit Home Watch, the Law Enforcement Spousal Conference by How to Love Our Cops held in Sacramento, CA on March 2, 2019. In Part 1 of our first “On the Scene” special, listen to portions of the event including the introduction from emcee, France Siria; the beginning of the Story of Strength session with Scott and Liz Brown; and tips from Julie Bevers during her breakout on Self Care. Also, Co-Host Kacey Smith interviews attendees Ryan Cleveringa and Michelle Pham on their law-enforcement families and their takeaways from Home Watch. Hear more about the Browns’ story in Episode 034 and more from Julie Bevers in Episode 033 of Beyond the Call. Learn more about How 2 Love Our Cops at www.how2loveyourcop.com. Episode 034 of Beyond the Call Life changed forever on October 24, 2014 for Scott and Liz Brown. It was the day Scott lost his partner Deputy Danny Oliver to a murderer on a routine check. Scott and his wife Liz share their story of healing and rebuilding their lives with the help of family, friends, and each other. Learn more about their work at www.how2loveyourcop.com. Episode 031 of Beyond the Call The co-founders of the Code 9 Project, Brandielee Baker and Deborah Ortiz, share their journey to create this organization as well as the training they offer to first responders to cope with PTSD and work-related stressors. Learn more about the Code 9 Project at www.code9project.org. Episode 029 of Beyond the Call Former Atlanta Police Officer and current Filmmaker, Patrick Shaver, discusses the making of his moving film, Officer Involved - a documentary which explores the highly secretive, often misunderstood, and socially taboo topic of what the officer experiences in the wake of an officer-involved shooting. Learn more about Patrick and Officer Involved at www.officerinvolvedproject.com and his future projects at www.indieclever.com. Episode 028 of Beyond the Call Rob Shaul, the Founder and President of Mountain Tactical Institute, shares details on his unique training programs for law enforcement as well as other first responders. He also shares tips on how to stay fit for your specific job. Learn more about Rob and Mountain Tactical Institute at www.mtntactical.com. Episode 027 of Beyond the Call National Police Credit Union Division President, Jim Bedinger, shares the story behind the creation of the brand by Chicago Patrolmen’s FCU. Jim also shares plans for the institution that benefit law enforcement and their families for the coming year. Learn more about the National Police Credit Union at www.nationalpolicecu.com. Episode 026 of Beyond the Call A discussion with Officer Joshua Rios, the founder of Blue Angel Coffee, about his career in law enforcement, his military service, and his entrepreneurial pursuits. Learn more about Josh and his business at www.blueangelcoffee.com. Episode 025 of Beyond the Call A frank discussion with Sara Slone, Director of Public Relations for Concerns of Police Survivors (COPS), on the challenges for family, friends, and coworkers of fallen officers and the many programs available to them. Learn more about COPS at www.concernsofpolicesurvivors.org. Episode 024 of Beyond the Call A discussion with Crisis Management Advisor and Author of Crisis Ready, Melissa Agnes, on how police departments and law enforcement agencies can turn adverse situations into trust-building opportunities with the public. Learn more about Melissa Agnes at www.melissaagnes.com. Episode 023 of Beyond the Call An enlightening and very entertaining conversation with Eva Vennari, the No BS Healer, on nutrition as well as physical and mental well-being for individuals in high-stress professions like law enforcement. Learn more about Eva at www.TheElevateInstitute.com. Episode 18 of Beyond the Call Dr. Rhoberta Shaler – author, speaker, and Relationship Help Doctor – shares valuable tips on how to deal with “Hijackals” both in the police department and at home. Learn more about Dr. Shaler at www.forrelationshiphelp.com. Episode 16 of Beyond the Call Vicki Newman, author of A CHiP on My Shoulder and A Marriage in Progress, provides tips on how to overcome some of the unique challenges of being a Law Enforcement Spouse speaking from the perspective of her continued fulfilling marriage to a CHP Officer. Learn more about Vicki at How2LoveYourCop.com. Episode 15 of Beyond the Call Joie Cheng, author of The Naked Truth, discusses her struggles with abuse, suicidal thoughts, and bouts of depression. She also shares tips and techniques from her book and programs that help Law Enforcement Families struggling with similar issues. Learn more about Joie at joiecheng.com. Episode 13 of Beyond the Call Officer Jennifer Kuleff of the Phoenix Police Department shares her work with the inspiring Hoops for Hope program for troubled girls in the area. She also shares a few fun stories about her experience both as a mentor of these young women and as a police officer. Episode 012 of Beyond the Call Former Patrol/K9 Officer, Tony Piatt, discusses his thriving business – Paw-a-Day Inn K9 Suites. He also shares tips for dog owners and a few stories from his time with the Danville Police Department. Learn more about Tony and his business at www.pawadayinnsuites.com. 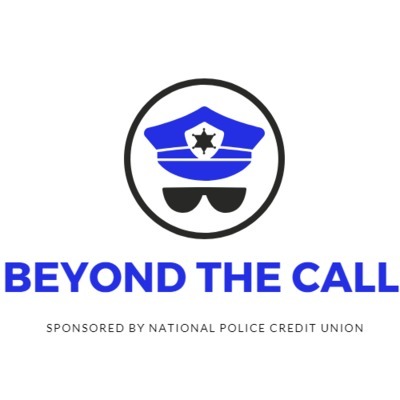 Episode 011 of Beyond the Call Co-hosts for Beyond the Call - Kacey Smith, Vice President of the National Police Credit Union, and Ken Bator, CEO of the Police Officers' CU Association – look back on the first ten episodes of the show. They talk about some of their favorite moments and a couple of the bloopers the audience didn’t see or hear. For more information on our sponsor go to www.nationalpolicecu.com. Episode 009 of Beyond the Call Sandra Millers Younger, author of The Fire Outside My Window and the creator of The ComeBACK Formula, discusses her harrowing experience of escaping from the devastating Cedar Fire in Southern California in 2003. She also shares the steps for resilience that she teaches to survivors to bounce back from tragedy. Learn more about Sandra and her ComeBACK Formula at www.sandramillersyounger.com and www.comebackformula.com. This episode is specifically dedicated to all the brave first responders around the country and beyond who risk their lives to keep everyone safe from wildfires. Episode 008 of Beyond the Call Chicago Patrolmen’s FCU CEO, Scott Arney, discusses the growth of the credit union and its 80 years of service to Chicago Police Officers and beyond. Episode 007 of Beyond the Call Retired Chicago PD Sergeant Thomas Wortham III and his daughter, Sandra Wortham, discuss the Peace in the Park After Dark event where the CPD interact with local children from the Chatham neighborhood. Episode 006 of Beyond the Call An interview with former crime analyst, Kim O’Neill. Kim shares her experience in working for the Long Beach Police Department and her journey to entrepreneur and business owner. Learn more about her and her business at kimoneillcoaching.com, facebook.com/KimONeillCoaching, and @KimsONAMission on Twitter. Episode 005 of Beyond the Call An interview with Coach Tony Blauer, the Founder of Blauer Tactical Systems. Coach Blauer discusses the unique elements that go into the self-defense training for Law Enforcement and other First Responders, specifically his patented Spear System. Learn more about Blauer Tactical Systems at www.blauerspear.com. Episode 000 of Beyond the Call Co-hosts for Beyond the Call - Kacey Smith, Vice President of the National Police Credit Union, and Ken Bator, CEO of the Police Officers' CU Association - introduce the new show for Law Enforcement Professionals and all those that support them. Kacey and Ken discuss their motivation for the show and what our listeners can expect.